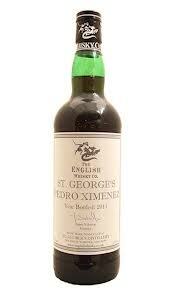 The English Whisky Co. mature some of their fine single malt whiskies in Pedro Ximenez Sherry Casks. These casks are full of beautiful rich dark sherry before delivery. Single malt is added to it and left in the casks to continue maturing. The resulting drink is a wonderful fortified wine, that makes a superb drink for many occasions. It can be drunk chilled, or as a lovely dessert wine. It is also glorious poured over ice cream. 19% Vol. 70cl.